Lovely moisturiser, and doesn't irritate my sensitive skin. Most importantly, it has very good SPF - was my only facial sunscreen on holidays last year and no problems at all. Quite a strong smell but I got to like it. I am on my 4th tube and I absolutely love it. the smell is pleasant and almost unnoticeable. And as previous commenters mentioned it absorbs quickly leaving skin refreshed and hydrated. I will keep coming back for it over and over again. 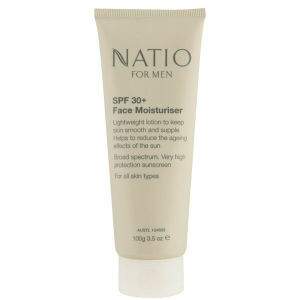 I am a big Natio fan and was quite excited about trying this High Factor moisturiser! Unfortunately, I have only ever used it once as it stung my eyes so much and by the end of the day my eyes were a total mess! I do have sensitive eyes and have to be careful what creams I use and this one was one of the worst I have to say. I haven't had any problems with the other Natio products I've used so please be aware if you suffer sensitive eyes when considering this product. Bought this because of price and SPF 30.Have been impressed by the quality and think it is good value for money.I have sensitive skin and have not experienced any problems.It feels comfortable on the skin and is not greasy.I am happy so far with my purchase. This is a great price for a good spf. I found it a little thick whilst applying but it absorbed well and did not feel greasy. I have not tried to apply makeup afterwards or had a nice hot day but in general it's a good product as far as I can see. Light and refreshing moisturiser. Great for warm climates as it isn't greasy. Very nice and light for use under makeup. I'd be interested to know how long the SPF lasts though, as I essentially bought it as a daily anti ageing product. This Natio Daily Moisturiser Uv Protection is the best ever face product. I love it! This Natio Daily Moisturiser Uv Protection is an excellent product. It's not greasy at all and can be absorbed quickly, doesn't clog pores after wearing all day.